05/21/18 (written by Lucy La Rosa)- Amid unprecedented levels of violence, the criminal justice reforms in Mexico are facing renewed criticism from political opponents. The oral adversarial system, fully implemented across the nation by 2016, remodeled the country’s trial system in an effort to reduce corruption, protect the rights of the accused and overall, strengthen the capacity of rule of law in Mexico. However, as of late, opponents have re-articulated their disapproval, accusing the adversarial system as the cause and culprit of rising violence levels. Said criticisms echo statements such as those by Miguel Angel Mancera, the former Mayor of Mexico City and current Senate candidate, who remarked last year: “There is an increase [in violence] that coincides with the large number of people who used to be imprisoned, this is a factor that has to be analyzed (El País).” According to Octavio Rodriguez Ferreira and David Shirk from the University of San Diego, even the sitting Mexican administration has principally set aside their support of the reform, which was originally one of the touted accomplishments of the incumbent President Enrique Peña Nieto. The Technical Secretariat for Judicial Reform Implementation, which provided institutional support for the reform, was abandoned only one year after the implementation of the reform and since, many political representatives have lobbied for the old, mixed-inquisitorial system that fostered the widespread use of pre-trial detention. However, proponents of the criminal justice system reform, continue to argue that these reforms are essential to strengthening functional democracy in Mexico and that a reversal of the reforms would merely led to further infringement on the rights of the accused. The reformed system intends to promote a greater standard of accountability for judicial system operators in their investigations and prosecutions and emphasized a strong legal defense for the accused. Moreover, as Rodriguez Ferreira and Shirk point out, it is illogical to assume that the criminal justice system can entirely resolve issues of crime and violence, which are caused by “underlying social and economic conditions” which are not necessarily remediated by judicial structure. In an article published last year by Animal Politico- an independent and pioneering Mexican news source largely focused on increasing transparency and access to reliable information- remains relevant today. The article, “The Accusatorial System and Violence: What the Data Says,” offers a detailed, data-focused response to naysayers and reiterates the need for the oral, adversarial model. 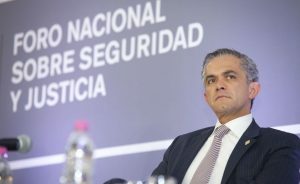 Using data and information from the Executive Secretary of National System of Public Security (Sistema Nacional de Seguridad Pública, SNSP), the authors argue that opponents’ assertions are based on skewed and inaccurate data manipulations. The article first points to the fact that the escalation in violence precedes the implementation of the reform. As a matter of fact, the uptick in violence began in late 2014, almost two years before the full effects of the criminal justice transition. The authors also emphasize that the majority of the rise in violence has been concentrated in a select number of states, specifically states that had already experienced high levels on violence during the Calderon administration’s war on drugs. Yet, not all states who previously recorded high homicide rates are re-experienced growing violence. Hence, a blanket accusation incriminating the criminal justice reform cannot reliably account for varying levels of violence across Mexican states. Finally, the article concludes by illustrating that there is no verifiable indication that petty criminals released on their own recognizance go on to commit violent crimes and contribute to increased homicide levels. Regardless of the lack of empirical evidence, opponents continue to decry the criminal justice shift that strengthened the standard of innocence until proven guilty, which under the old system had been negligible at best. These political adversaries particularly highlight the number of criminals released or at liberty due to a lack of sufficient evidence, arguing that these individuals contribute to rising levels of violent crime. This argument, however, is a tipping point for advocates of the criminal justice system who caution against hasty conclusions. “The [adversarial] system is not the problem; the problem is in the lack of capacity among institutions,” responded Karen Silva from the Center of Investigation for Development (Centro de Investigación para el Desarrollo, CIDAC), one of the leading institutions in assessing the performance of the new judicial system (El País). She continued, emphasizing the irrationality of opponents’ logic, which does not take into account that the majority of those released from prison populations were detained for petty, non-violent crimes. Rather, she argues, that the rise in violence can be attributed to a lack of knowledge and skill among criminal justice operators, including police, prosecutors, public defenders and judges, that perpetuates high levels of impunity. In turn, impunity reinforces a precedent that violent crimes are wont to go unpunished and uninvestigated and deteriorates citizens’ faith in the judicial sector. Regardless of the lack of causality between judicial reform and rising violence in Mexico, the country is experiencing a lack of capacity among judicial institutions. Justice in Mexico’s research initiative, Justiciabarómetro, was established to identify areas for improvement within the justice system by evaluating the professional development of judicial actors, and their perceptions on the functioning of the judicial system. 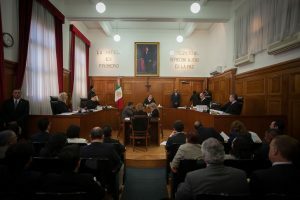 The most recent 2016 survey results, which covered 11 Mexican states, identified several persisting challenges within the judicial system including: a lack of training in oral litigation and a persisting belief that authorities can operate above the law in the pursuit of punishing alleged criminals. However, the survey also revealed some positive changes in comparison to the first Justiciabarómetro report in 2010. For example, about 80% of the survey participants believe that the judicial reform will reduce corruption and about 95% prefer oral, adversarial trial procedures to the mixed-inquisitorial system. The overall intention of the Justiciabarómetro project is to provide baseline measures for the evaluation of the Mexican judicial system and a jumping-off point for Mexican policymakers in their capacity-building efforts. A visual factsheet of the 2016 Justiciabarómetro study can be found here. Rather than regressing backwards to an old judicial system that often undermined the rights of the accused, Mexico should focus on strategic capacity building among judicial operators, including police, prosecutors, public defenders, and judges. Without institutional support and trainings, judicial operators do not have the tools or knowledge to fully protect rule of law in Mexico. This entry was posted in Judicial Reform and tagged Animal Politico, Center of Investigation for Development, Centro de Investigacion para el Desarollo, CIDAC, David Shirk, Judicial Reform, Justicebarometer, Justiciabarómetro, Karen Silva, Mexican judicial system, Mexico Institute, Miguel Angel Mancera, Octavio Rodriguez, Octavio Rodríguez Ferreira, oral adversarial, Viridiana Rios, Wilson Center, Woodrow Wilson Center. Bookmark the permalink.